RISE seeks to understand what features make education systems coherent and effective in their context, and how the complex dynamics within a system allow policies to be successful. We hope that lessons generated from the Programme will lead to positive policy change and can be used to concentrate resources and efforts to accelerate the rate of learning in developing countries. By looking at various education system features, such as the way in which goals are set; progress is assessed and measured; the teaching profession is structured and supported; schools are financed and managed; students and parents engage with the system and make choices; and innovations are produced, evaluated and diffused to scale; we can begin to see a broader picture of how these features might work together to enable an effective system. Country Research Teams (CRTs) – Responsible for the detailed research and data related to education systems in their respective countries. The teams will also actively engage with the relevant policy makers to help inform their research. Intellectual Leadership Team (ILT) – Comprised of world-renowned scholars with expertise in various aspects of education systems, development, measurement, and analysis, the ILT provides thought leadership, research advice, and scholarly assessment of RISE activities and output. The ILT produces working papers and provides insight into the field of education systems research. Directorate – Leads, manages and implements the research programme. Responsible for synthesising the ideas and research of the CRTs and ILT into policy recommendations and output for a global audience. Over the past twenty-five years, the share of children enrolled in school in sub-Saharan Africa has jumped from barely half to 78%; in South Asia, from 75% to 94%. Yet despite the growth of enrolment, the world faces a learning crisis. The 2014 UNESCO Global Monitoring Report stated that 250 million children are unable to read, write, or do basic mathematics, and 130 million of those children are in school. Many students—even those who have been in school for years—lack a solid foundation in the skills they need. Even more recently, the 2016 Education Commission report predicted that in 2030, 69% of school age children in low-income countries will not learn basic primary level skills. The question is, “How do we move from schooling to learning?” At one level, we already know the answer. Unlike producing controlled nuclear fusion or a viable vaccine for Ebola, we know how to teach children to read or do basic mathematics. Researchers have carefully calibrated the learning gains from specific interventions, like school feeding programs, computer-assisted learning, and remedial education. Many countries have pockets of success where these tools are deployed effectively, with excellent schools and teachers delivering quality education. But these successes often do not happen at scale. High-performing schools are restricted to a narrow set of affluent families. Innovative pilot projects demonstrate potential, but often fail to translate into far-reaching policy reform. At the current rate of progress, it will take developing countries 100 years to reach the average education levels in OECD* countries. If we are to effectively tackle the complex and multi-faceted problems presented by the learning crisis, there needs to be a global paradigm shift in the approach to research and policy, which focuses on education at a systems level. There is an urgent need for more research on solutions beyond business-as-usual, incremental increases in materials, infrastructure or other inputs—instead, RISE seeks holistic, practical answers about how education systems can innovate, improve learning outcomes, and better serve all children and communities. If we are to reach Sustainable Development Goal 4 by 2030, “to ensure inclusive and equitable quality education and promote lifelong learning opportunities for all,” the world needs audacious goals that will inspire substantial acceleration and progress towards true ‘Education for All’, particularly for the most marginalised. However, the existing evidence base is short on answers for how these goals can be achieved. RISE seeks to answer questions on how reforms accelerate progress in student learning using a variety of disciplinary approaches. RISE is looking for more than the immediate causes of the success or failure of a reform to improve learning. Instead, RISE research seeks the broader, system-level causes for how reforms happen and why. Studying these areas will require a range of methods, each driven by the research question and tailored to the context. Other metrics, including interviews with teachers, administrators, parents, education implementers, thought leaders, policymakers, students, out-of-school children, etc. To learn more about the detailed studies of our CRTs and their insights into their respective countries, please visit the individual country pages: Ethiopia, India, Indonesia, Pakistan, Tanzania, and Vietnam. Details of what is expected from the RISE Country Research Teams in terms of the scope, methods, and objectives of in-country projects funded by the Programme (RISE Terms of Reference) can be downloaded for viewing. A multi-disciplinary Intellectual Leadership Team comprised of world-renowned scholars and practitioners provides strategic, intellectual, and practical advice to the Programme and the Country Research Teams (CRTs). The CRTs are responsible for the detailed research and data related to education systems in the focus countries. The Programme also benefits from special advice and guidance through subject matter experts on the Programme’s Delivery Board. 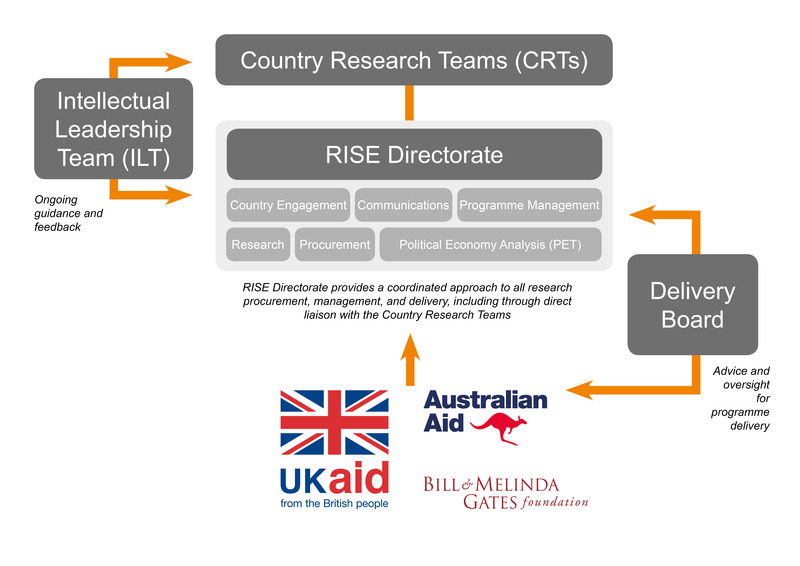 RISE is supported by £36.8m in funding from the United Kingdom’s Department for International Development (DFID), A$9.85m from the Australian Government’s Department of Foreign Affairs and Trade (DFAT), and US$1.7m from the Bill & Melinda Gates Foundation. If you are interested in funding research through RISE, please contact the RISE Directorate at info@riseprogramme.org. We welcome the chance to discuss how additional funding can allow the expansion of RISE and enable us to extend the reach of the Programme. For information on the procurement process for the RISE Country Research Teams, please click here. All outputs from the research are considered as global public goods, accessible through this website and in accordance with the UK Department for International Development (DFID) Open Access Policy.